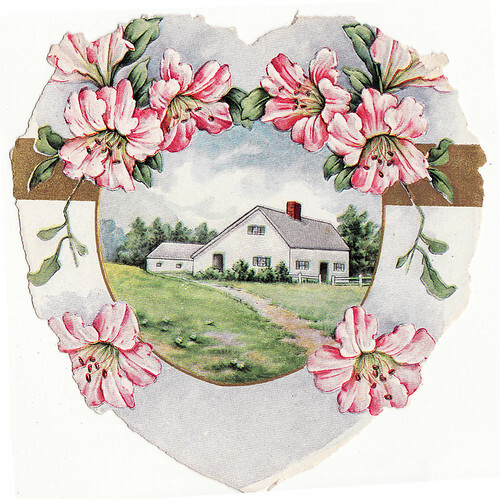 These valentines are interesting because they simply show a house in a heart. There's no mention to a house or home in any text. It seems the house is just enough. Maybe the inclination is that your heart is my home or my home is your heart or something like that. The again, maybe people just like the house as an object, as I do, which is why I collected these. This one is from 1923. On the back it says From David R to Alice G. and 1923 penciled in. This postcard below is blank on the other side. 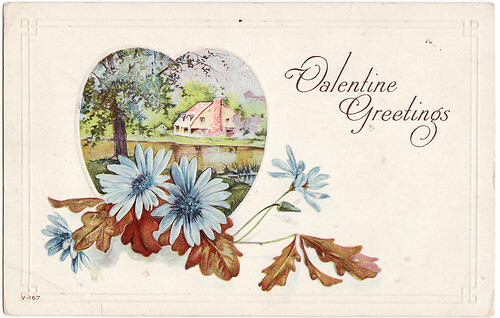 I just listed a couple new Valentine postcards in the shop and will post more soon. Maybe they appeal to the nesting instinct. :) I think they're very pretty, especially the first with the uneven outline. Happy PFF! Interesting idea about these houses in a heart. I would prefer to live in the house of the second card. Both your cards are great, I'm heading over to your other site. Love Valentine cards. I like them too. It brings to mind all of the comforts of home.